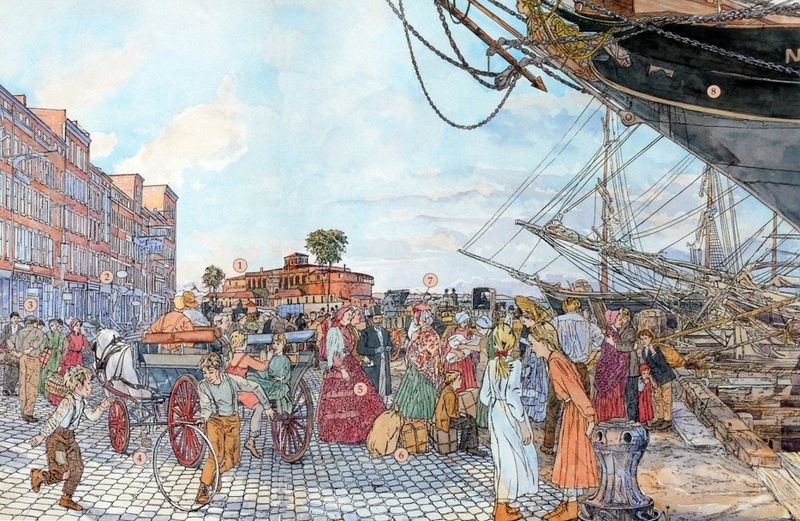 This dock scene from the American Girl book Welcome to Kirsten’s World - 1854 is a compilation of many reference images. In the end, after I had sketched, revised, then sketched again, and after drawing and redrawing the art until it was complete, an art director was struck with a vision of pigs wandering throughout the crowd and requested that I “just add in lots of pigs.” Gratefully, my agent rebuffed this idea. To illustrate the two boys in the foreground, I hired local children to run with a hoop – a game this is now a lost art. They performed brilliantly. The two young girls in the foreground are the daughters of my local artwork framer.